The System with Exchangeable Function for Dip Coat Liquid Circulation Mechanism DT-1404-S1 | SDI Company Ltd.
1. For the requirement to dip-coat with plural kinds of coating liquids.2. 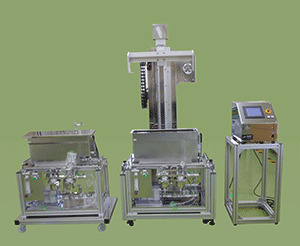 This is the dipcoater which has been realizing the wish for easier treatment of the permutation of the coating liquids with changeable function by whole of each coating liquid circulation mechanism itself.This is the dipcoater System which can easily permutate whole of the circulation mechanism (filter, pump, etc.) of the coating liquid. It is available to permutate plural different kinds of coating liquids in whole of every circulation mechanism. There is no limitation number to add with the permutation parts. Dip Speed from0.1mm/sec. to 60mm/sec.